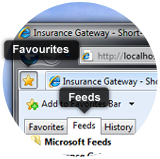 Please note the feeds below are for the Retirement Consumers Gateway only. Below is a sample of the RSS Feed for the Retirement Consumers Press Room. Longevity in women: a blessing or a financial burden? The age, expressed as an integral number of years, of an insured policyholder, which spreads over the period from six months prior to a birthday to six months after a birthday. For example, an individual is ‘age 35 nearest birthday’ from the time he is thirty-four and six months of age until the time he is thirty-five and six months of age.